The Government has been accused of "declaring war" on trade unions amid rumours that ministers are considering tightening up laws on strike ballots. Employers have been pressing for changes to strike ballots so a set number of union members would have to vote before any action could be held. Unions now say they fear ministers are considering changes to the laws on voting, following a spate of recent strikes by British Airways cabin crew and railway workers. Paul Kenny, general secretary of the GMB, said: "It is a testament to the priorities of this Government, led by two public school boys, that they should consider attacking the rights of ordinary workers rather than the bankers who caused the recession. This is a declaration of war on the trade union movement and our response will be robust as we lay down plans for co-ordinated and generalised industrial and community action against the cuts. "More and more we are seeking the well-to-do upper class targeting the lower class and make them pay for the recession. It is unfair and unacceptable." Bob Crow, general secretary of the Rail Maritime and Transport union, accused ministers of "declaring war" on unions and of seeking to prevent workers from fighting back against cuts in jobs and public spending. He said: "The ConDems know that by far the biggest campaign of resistance to their austerity and cuts plans will come from the trade unions. "They are running scared and are now looking to tighten the noose of the anti-union laws around the workers' necks to choke off resistance. "This is a declaration of war on the trade union movement and our response will be robust as we lay down plans for co-ordinated and generalised industrial and community action against the cuts." Prime Minister David Cameron's spokesman said: "We have no plans to reform strike legislation." The CBI last month called for changes to strike ballots, suggesting that 40% of union members would have to take part in voting before any action could be held. 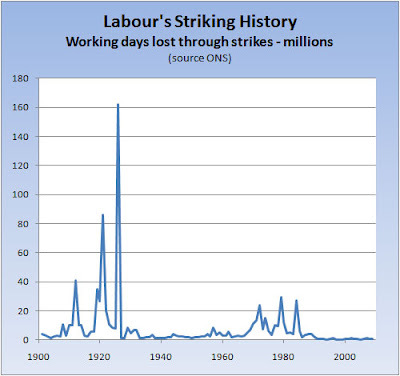 The question is would any attempt to limit strikes just make people more likely to do it? The Unions could point to any rule changes and use them to stoke up resentment and end up with more solid support. This is looking more and more a like a trip back to the 70's- class warfare makes a comeback. I don't think young Cameron and Osbourne have ever heard of JFK. They think if you press the buttons it all just works. The BT strike has been postponed because of doubts about the technical and legal robustness of the voting system. It is now very much harder for workers to take official strike action than it ever was. No further tightening of the rules is, to my mind, warrented. To do so would be the expression of a Government carried away with its own power. A good deal of Liberal support came from Union members, it always has. Can't see that continuing. Well, right wing as I am, there is a grain of truth in the charge that it is often Jo Public who pay the most for economic failure in terms of loss of living standards. That is not to say that strikes will help anyone. They probably won't and are more likely to cause job losses than anything else. However if the Govt wants to say, 'we are all in this together,' I expect them to make sure we all share in the difficulties fairly. Telling public servants they want to restrict their redundancy to the amount received by the private sector seems perfectly fair. In fact I was moaning at their exceptional payoffs only 1 day before the recent announcement to try and change that. If I was in Govt I would move to ensure that wealthy people actually do pay some tax in a fair manner, rather than paying for an accountant to legally avoid most of it. Unfortunately it all too possible. Unfortunately I don't think there is much chance of what you suggest happening any time soon. TPTB will wait until it becomes really nasty and dangerous, as usual. Some of the legal challenges to strikes are just absurd. If it wasn't big business taking action against those 'dreadful selfish' strikers there would be an outcry against such petty misuse of the legal system. In most companies including BA and BT it was actually quite hard to get anyone to come out on strike even before Thatcher's laws. I think the law of unintended consequences may come into play here. the outcomes of the votes will look more convincing. Over 40 per cent of the total workforce backing strike action, and over 50% of those voting. And more people turning out to strike on the day. 50,000 people vote in a ballot and their vote is overturned by one tw@t in a suit. that's democracy for you. An Official Strike is not the only way to be heard. Have a ..... National Sick Day !! You can't be doing anything "illegal" if you're on a self certified sicky. When being "sick" on a strike day one must provide a doctor's note. ... as opposed to the Labour party, which is currently being temporarily run by a public school girl with family ties to the aristocracy, whose father, mother and aunt went to public schools (her uncle to Eton), whose family are best known for their tendency to defend serial killers, and who is also related to Chamberlain, who, incidentally, went to Rugby. This is either a desperate attempt by politicians to create an issue that does not exist or else they are expecting a lot of industrial conflict in the near future. Free Trade Unions are actually institutions that are hall marks of liberal capitalist democracies. They are essentially just a means for workers to bargain their labour at the highest price. Neutering them them is the sort of thing you see in totalitarian states such as Marxist Cuba or Nazi Germany where all worker organisations were essentially just arms of the state.